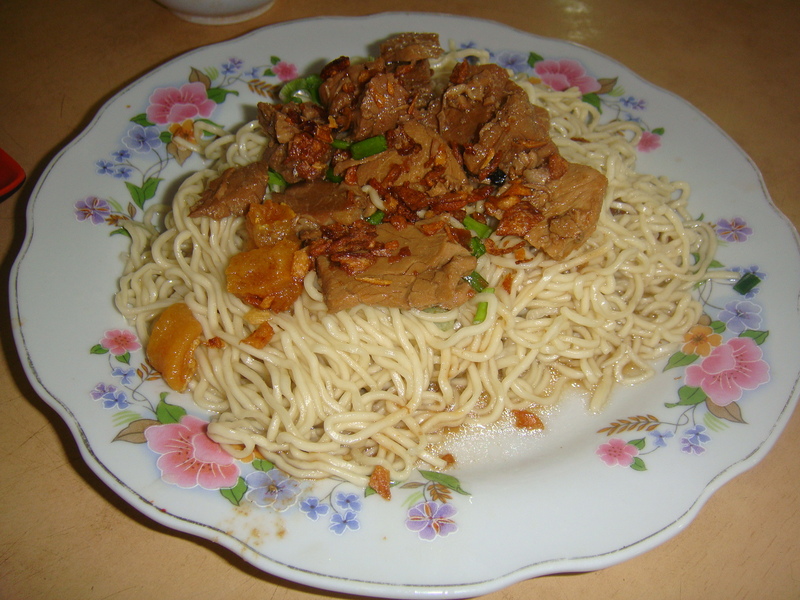 Kolo Mee (Noodles) is one of the most popular, readily available (locally) wholesome meal for the locals and visitors alike. 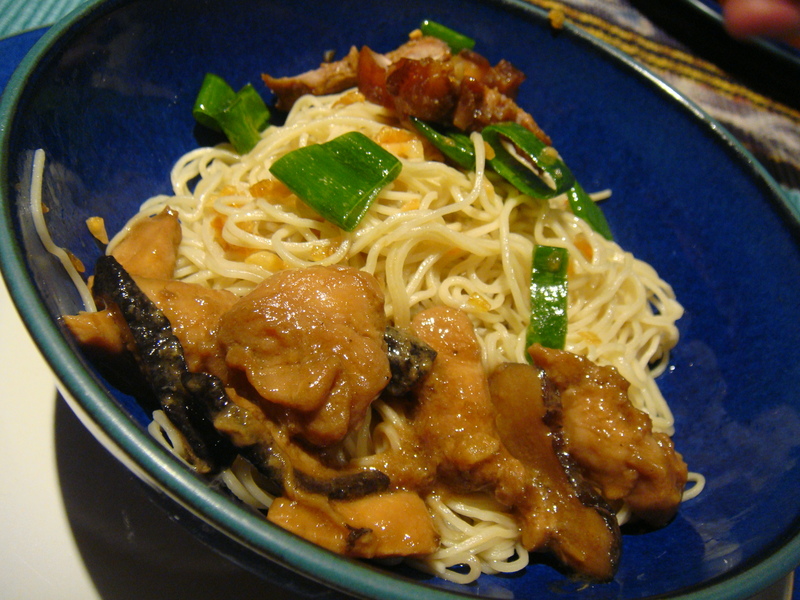 It is a substitute staple food for rice. Eating is the past time of every Asians. 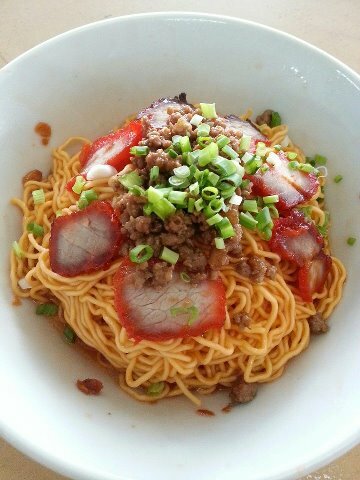 Kolo Mee is a local favourite be it breakfast, lunch, dinner or supper. Toppings are mostly with cha siu (bbq pork), minced pork, minced pork or chicken & dried mushroom (Kai See Mee). Prices per standard bowl of Kolo Mee was 70 sen (1970s), $1.20 (1980s), $1.50 (1990s), $2 (2000s), $2.50 (2010s), $3.50 (today). Extra toppings such as with prawns or seafood would cost a couple of ringgit more. 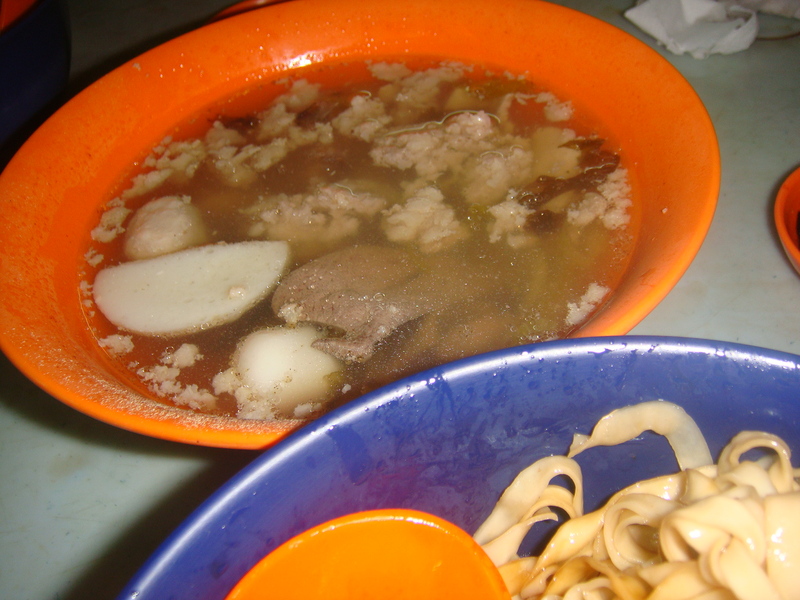 The above picture shows a standard bowl of Kolo Mee with cha siu (BBQ pork). When I was a child, locals would queue up at the shops opposite my school, St Mary’s Primary to buy their favourite Kolo Mee. Other popular spots were the corner shop at Sekama Rd, popular for their Cha Siu Ewe (marinate leftover after seasoning BBQ meat) Kolo Mee (see below). Selling today at $4 ???? A corner shop (in between the alley way) at China St sells the popular Chicken & Mushroom Kolo Mee (Kai See Mee). Today’s price $4 ???? Bishopgate St’s Kolo Mee which is served with a big bowl of tasty soup (cost was $4 in 1980s and $8 tody’s price). 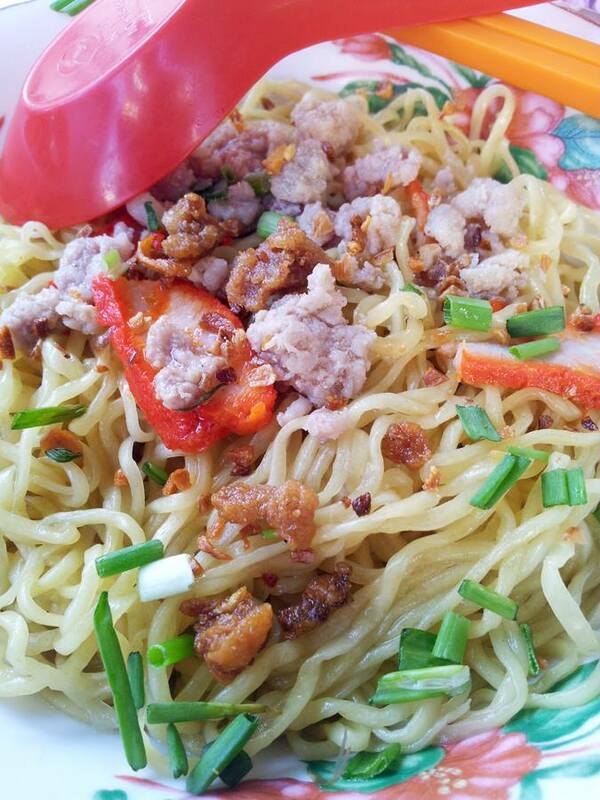 Today, Kolo Mee is available in every nook and corner of Sarawak. However being ‘home away from home’, I have learnt to cook my own Kolo Mee. I am now an ‘expert’ Kolo Mee cook’ and proud to post my own signature Kolo Mee (perhaps I should name them ‘Jes Sie Mee’. All rights reserved for below pictures, all original publications of ‘Jes Sie Mee’. 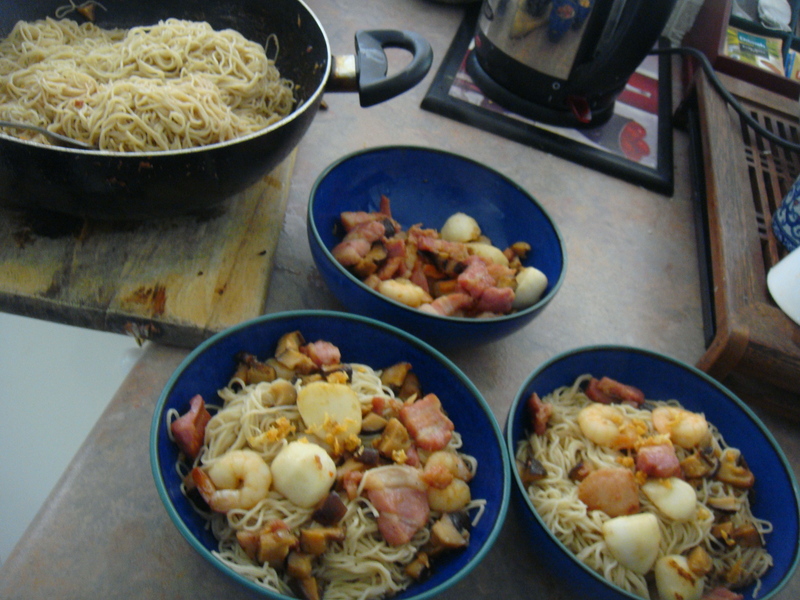 Although they taste almost similar to authentic kolo mee, I do improvise the toppings depending on what is available in my fridge, bacons, minced pork, chicken, fish cake, fish balls or prawns. 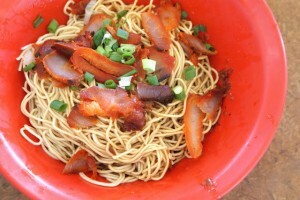 Below is a gallery of more Kolo Mee. Most of the pictures were snapped by yours faithfully while some pictures were extracted from my local facebook group with thanks and credit to all of you concerned. And last but not least while we are on the topic of Kolo Mee, I am pleased to share that my 4 ku (Fourth Uncle) is Singapore’s noodle king. While he is king in making noodles, I am queen in eating it. Slurp…Slurp !!! 1. Pour some oil and fry the garlic till brown. Leave aside. 2. Bring a pot of water to boil. Add fresh noodles boil for 5mins. 3. Remove noodles from pot using a net or colander and run it through cold or tap water. Return noodles to boiling water to heat it up again and thereafter, drain the noodles after 30 seconds. Set aside. 4. Using the oil from the garlic,stir fry minced pork till completely cooked (about 2 minutes). Add the mushroom and then the fish balls. Dash a little soya sauce. 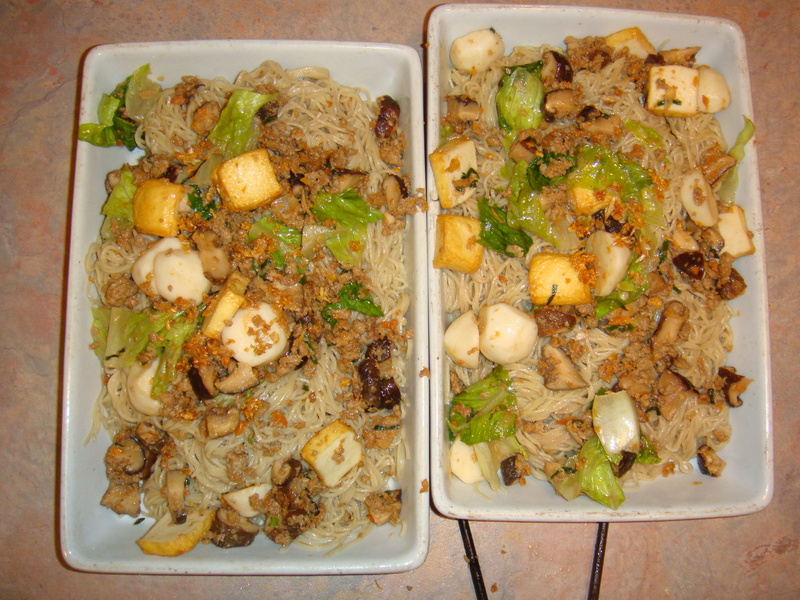 Remove cooked minced pork and set aside. 5. In a large bowl, add all the seasoning and stir well. Add cooked fresh noodles and stir till evenly coated by the seasoning. Separate the noodles onto three serving plates. Add some cooked minced pork and garnish with fried garlic and spring onions. Here’s something about my 4 ku. Chin Boon Foodstuff Trading was established in 1989 by Mr. Phua Koon Heng to meet the increasing demand for freshly made noodle products.For the past 18 years, we have been dedicating continuous effort to improve the taste and quality of our noodles besides daily production. We are the first to venture into full-scale automation using modern technologies. We replaced small manually-operated machineries with large-scale automated production line. This streamlines our manufacturing process to meet the growing demands while ensuring good quality control of our noodle. Consistency in the quality of the noodle is maintained daily under high standards of hygiene.As our modern machineries are custom-designed and specially tuned by our founder, Mr. Phua Koon Heng who has more than 40 years of noodle making experience, it gives our noodle the unique Chin Boon trademark taste and texture. We also ensure the freshness of our noodle by speedy delivery to our customers. 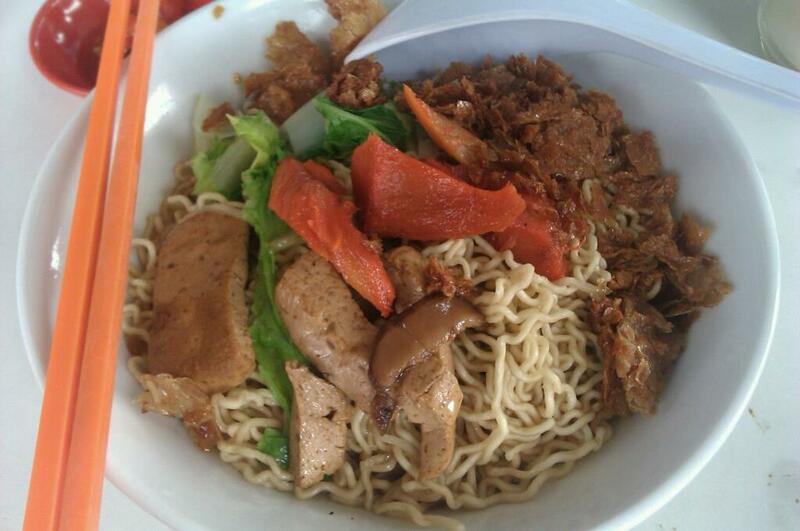 This entry was posted in Food (Makanan) and tagged chin boon foodstuff trading, kuching kolo mee, noodles by Little Borneo Girl. Bookmark the permalink. 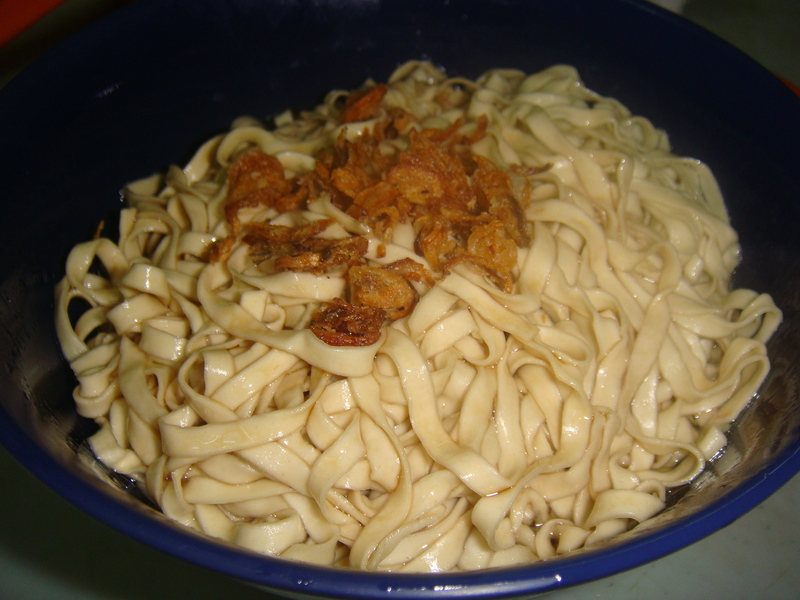 Kolo Mee is normally made from thin noodles as base rather than ‘Kiaw’ which is normally served as a side dish. 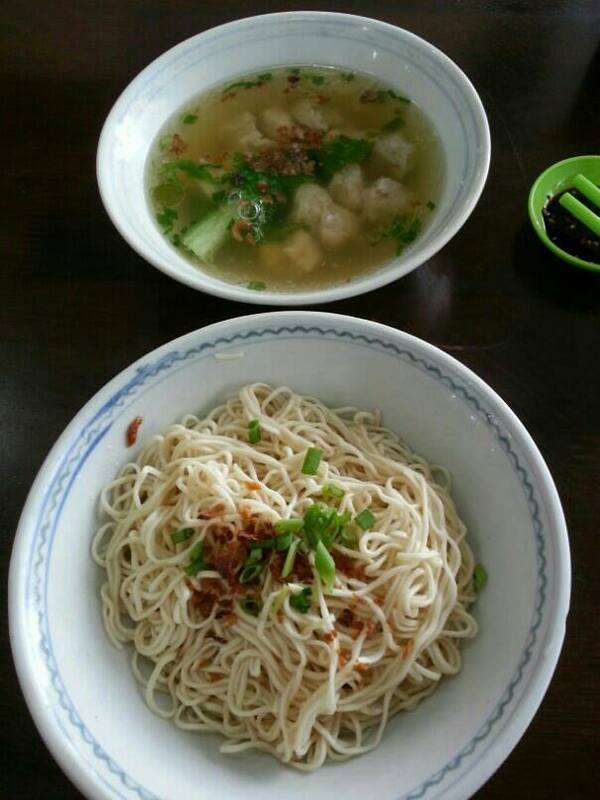 Some places serve Kolo mee with plain soup on the side or one could order ‘Kiaw’ soup as side. 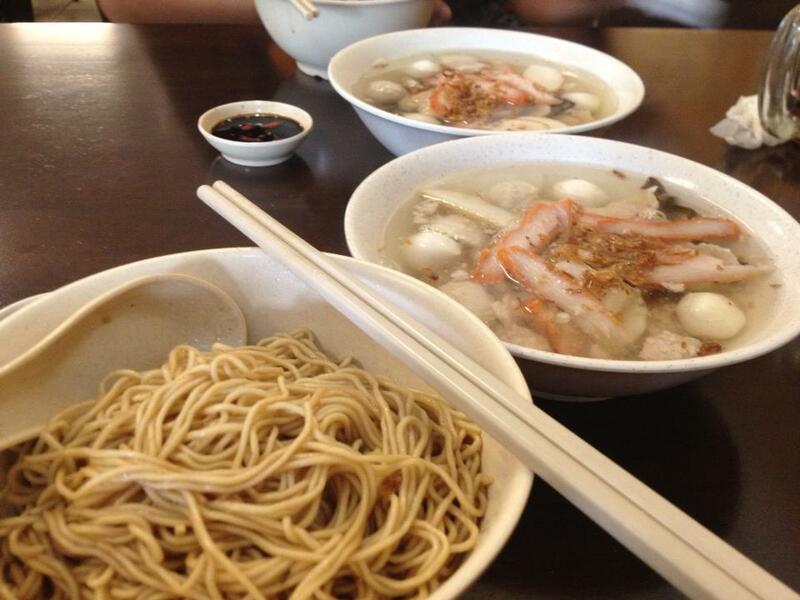 Some Kolo mee base can be ‘mee pok’ (flat thicker noodles like fettuccine), kueh tiaw (rice noodles) or bee hoon. Thanks for yr comments. Mom. Can’t wait to try this recipe! Lived in Kuching many years ago and have missed kolo mee dearly. 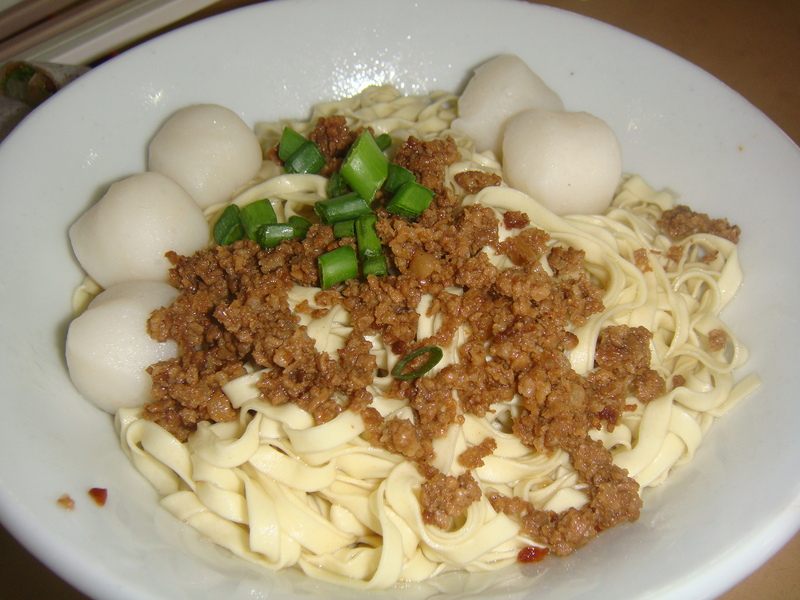 love the kolo mee pictures and recipe (maybe will try one day). for your info and others, lard oil is “healthier” than vegetable oil. like everything in life, moderation is key. my mom would fried red onions until brown and then keep a bottle of the oil n onion in fridge. Sorry, can only visit your blog now and thanks for highlighting to me about this post. Well written and I am just wondering if your uncle did sell the Kuching type of Kolo noodles (uncooked) or distributed to any of the outlets in Singapore? I am seeking high and low for such noodles…. Cheers and I presume you are overseas when you read my facebook post? Have a nice day. Hi does your uncle sell raw kolo mee? Yes. It’s the Singaporean kind like kai see mee. He’s got all sorts, the mee pok and others. Are you from Singapore? Hi Teo, I have never tried to make the kolo noodles itself from scratch. I buy ready made fresh egg noodles from Asian supermarket. 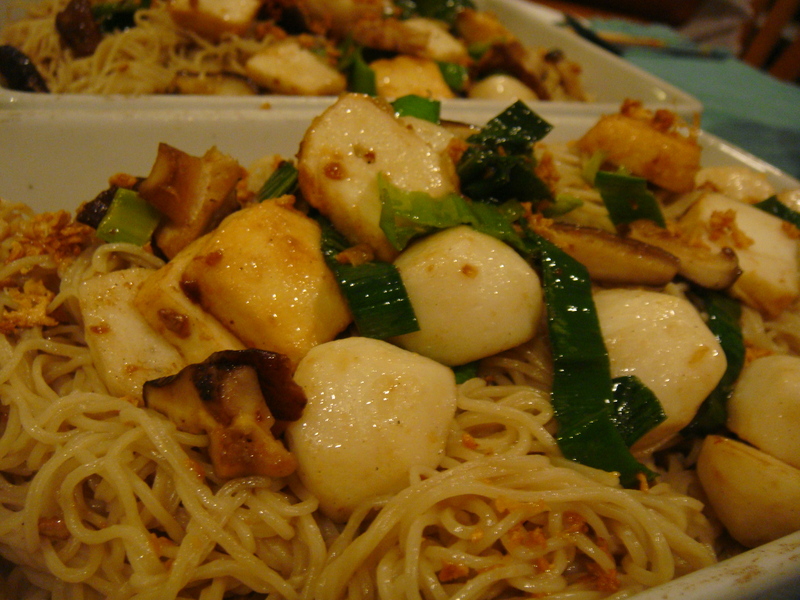 I guess if you wish to make the fresh egg noodle you could try check out this link. may look the same but guarantee you that the taste is 2 universe apart. I have tried both. 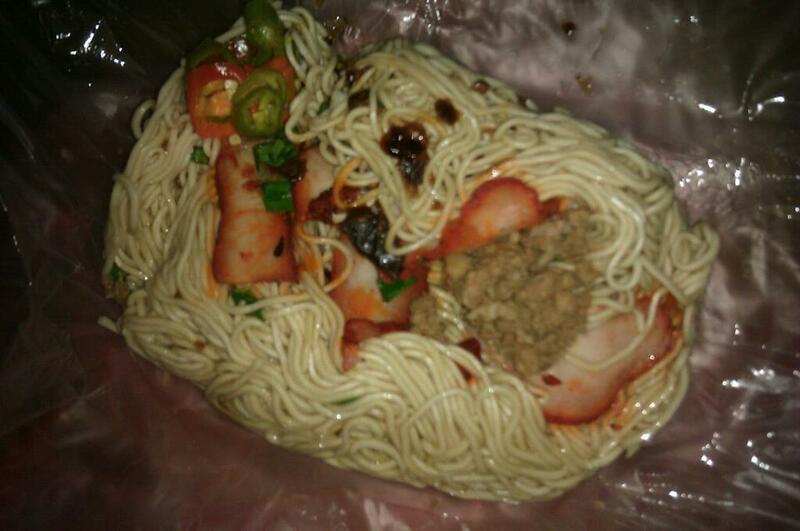 You could buy these noodles from most asian supermarkets. They now even have kolo mee in instant packets. Are you trying to make the dough for noodles (Mee) ? I’ve not tried making them but the recipe is probably similar to making fresh pasta. THose beautiful pictures make me “lau Nua”.